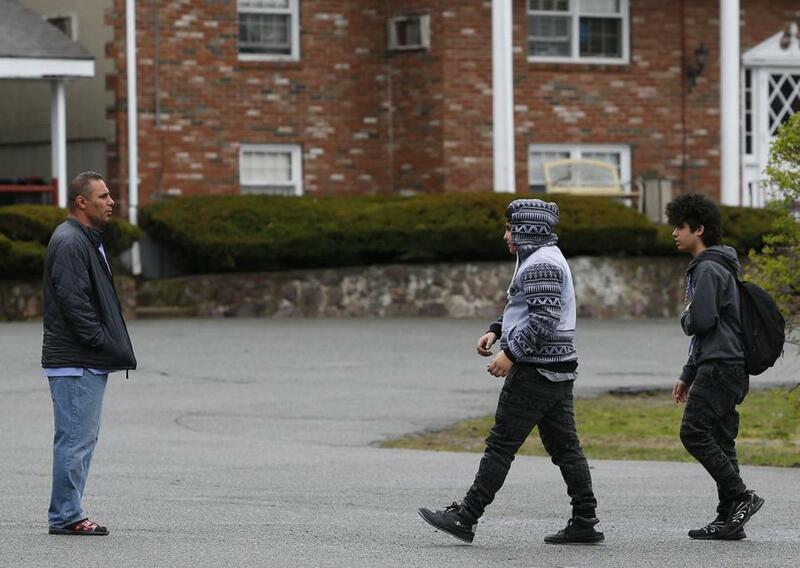 Ahmed al Rubaye met his children as they got off the bus in Saugus on Tuesday. The state had threatened to evict them from their motel for allowing guests inside their rooms. 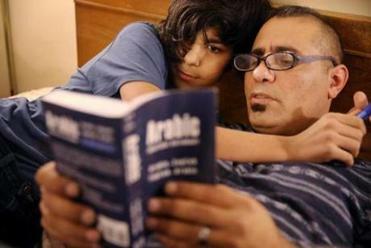 SAUGUS — The state has dropped plans to evict an Iraqi family, recently profiled in the Globe, for allowing guests into their state-subsidized motel room, including a Globe reporter and photographer. The family of nine, refugees who arrived in Massachusetts in 2014, has been living in two motel rooms at the Colonial Traveler Inn in Saugus for about three months. But on Friday, several workers from the Massachusetts Department of Housing and Community Development visited the family and accused them of violating the state’s emergency shelter policy, according to Ahmed al Rubaye, who has seven children with his wife, Abeer. State policy prohibits homeless residents who are staying in state-subsidized hotels from having guests. That same day, Rubaye received written notice that beginning next week, the state would no longer pay for the motel rooms. After escaping war and sectarian violence in Iraq, a refugee family of nine is now homeless in America. Two of the alleged violations were for allowing a Globe reporter and a photographer into one of the family’s motel rooms, along with two other friends of the family. The Globe was unaware of the state policy against visitors. Rubaye provided the Globe copies of the complaints, which indicated that they were filed with the state by the motel’s general manager. The story on the family’s struggles was published last Saturday, the day after Rubaye was told they would be evicted. But on Tuesday, Rubaye said he was visited by a state housing official, who told him the state had changed its mind and decided not to pursue the alleged violations. Rubaye said he was immensely relieved. “I am happy that we will not be sleeping in the street,” he said. Cherifa Khaddaoui, a friend who often serves as a translator for the family, said the uncertainty had been trying for them. Paul McMorrow, a spokesman for the Massachusetts Department of Housing and Community Development, which oversees the motel program, declined to comment on the case. Under state law, the director of the Department of Housing and Community Development has the right to waive an eviction decree of a homeless family housed by the state. The third alleged violation involved allegations that the family’s “6-year-old son” had thrown rocks at cars earlier this month. In an appeal of the state’s decision, Rubaye wrote that he does not have a 6-year-old son — his youngest son is 7 — and denied that his child had thrown rocks at anyone. The state provides emergency housing for homeless families who have school-aged children, and has long used motels to offset a shortage of affordable rental units. As of late March, 1,361 families lived in motels across the state, including 1,351 children. On average, a family spends 341 days in a motel, at a cost to the state of $117 a night to house them, according to state officials. The motel’s general manager declined to comment.